P&O Cruises – Pacific Eden recently underwent a multi-million dollar renovation that introduced an Aussie elegance to this South Seas cruise ship. Based in Sydney, Australia, the 1,500-passenger liner journeys throughout southeast Asia, the Pacific islands and popular Australian ports. “Waterfront now has a double-high ceiling, quite unique on a cruise ship, and we wanted to dramatize it even more by specifying a two-story Weave Wall,” says Petra Ryberg, principal designer and MD at Petra Viktoria Design with offices in Malmö, Sweden. Ryberg was affiliated with Tillberg Design of Stockholm during the renovation. Our expert project managers work with designers, architects and builders to create pre-fabricated designs for ease of installation. 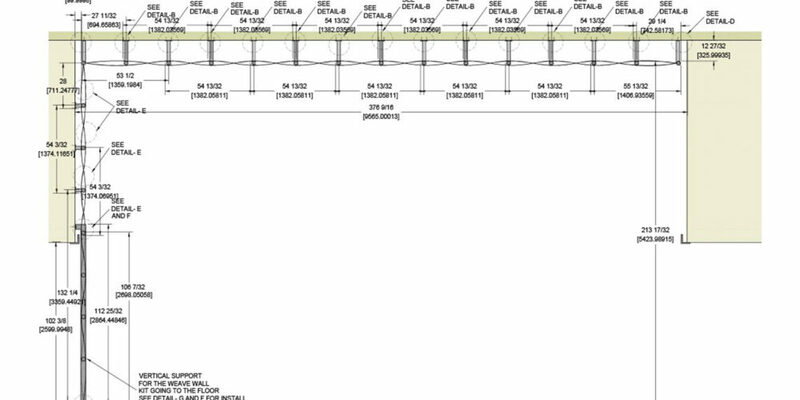 We coordinate with other trades throughout all phases of your project. You provide the design concept and we’ll take care of the rest. In dry dock in Singapore for just two weeks, Pacific Eden was retrofitted by FCR of Finland. This extremely tight schedule was the project’s greatest challenge, says Ryberg. All materials had to be on-site and employees ready to jump onboard when Pacific Eden arrived. “The design and composition of the Móz material was very suitable for a cruise ship,” says Ryberg. ”It’s not heavy and allows customizing opportunities. “For example, Móz Designs helped us integrate back lighting, giving the illusion of panels floating off the wall and ceiling. “The texture and shimmering color of Weave Wall were absolutely ideal for this venue,” says Ryberg. Because the ceiling was higher than usual, a scaffolding network was built up so the woven panels could be installed. Móz Designs provided all mounting and installation hardware, and highly detailed construction drawings, so the project moved along without a hitch. 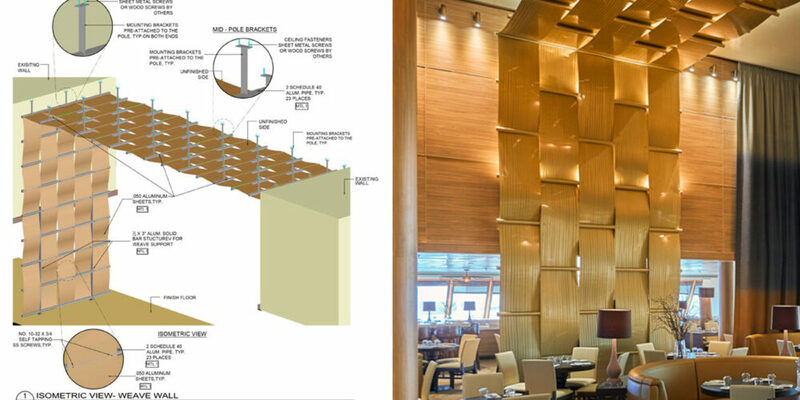 Weave Wall is fabricated from five contiguous panels of .050-inch thick solid core aluminum that streams up the wall and across the restaurant ceiling. Each of the five panels measures 31-feet long and approximately two-feet wide for a total width of 10 feet. A polygloss coating was applied at the factory to ensure a lasting finish and durability. 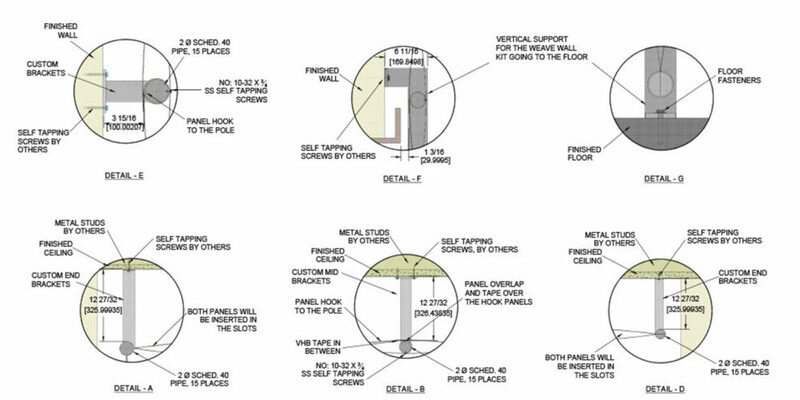 The panels weave through a series of Schedule 40 clear-finish aluminum poles. Mounting brackets pre-attached to the poles were used to affix the poles to the ceiling and wall.